This is the second part of a 2-post series. The first half can be read here: “Whaling, In the Eyes of the Faroese.” These articles aim to present a fair and unbiased look at both sides of the Grindadráp (the Faroe Islands’ name for summer slaughters of pilot whales). If you have corrections, opinions, or questions, please comment at the bottom of this page. Most reasonable people support the conservation of the Earth. The majority do so charitably, or through little easy actions throughout one’s day: turning off the lights when leaving a place, turning off running water, recycling, etc. Perhaps they’ll attend a public protest to show solidarity. Some find a deeper passion in conservation, and want to actively protect the environment. They learn about the intricacies of a part of nature, becoming scholars in that natural niche. After one’s an expert, he or she will go on to use his or her acumen to influence and expand macro ‘green’ efforts. This can manifest in any way, from PR campaigns to new technology. Still others fill their plates with activism. They distrust the effectiveness of corporate approaches, and act on the urgency of problems around them. Activism is usually seen as either heroic or kooky. It aims to be disruptive — sometimes to send a message, and other times to actually interfere with a practice. 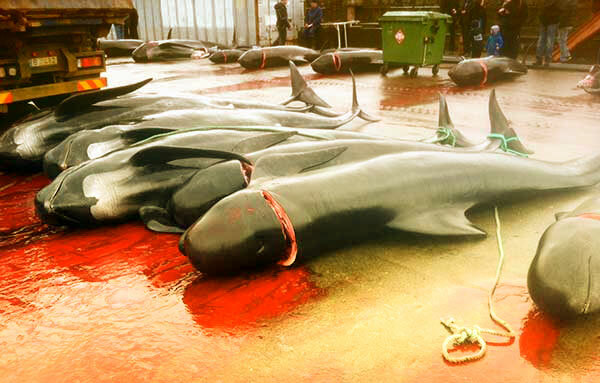 Over the past several years, the efforts of the controversial organization Sea Shepherd have made the Faroe Islands (and their Grindadráp, shortened as Grind) a prime target for campaigning. The group has sent teams of black-hooded young activists from all over the world to track and scare away pods from the islands. They are equipped with state-of-the-art marine vessels and equipment. Following the television series “Whale Wars,” Sea Shepherd has amassed a massive social following. The majority of those who support the organization fall into the first group of conversationalists — they make their difference with a comment, a like, or a donation. Sea Shepherd’s rhetoric is militant, as is their posture in the Faroes. They take day and night shifts on their boats, and travel around in-uniform and in groups. Even if they support Sea Shepherd’s cause, most Faroese I spoke with criticize the organization’s disregard for the tiny local tourism economy and intimidating air. 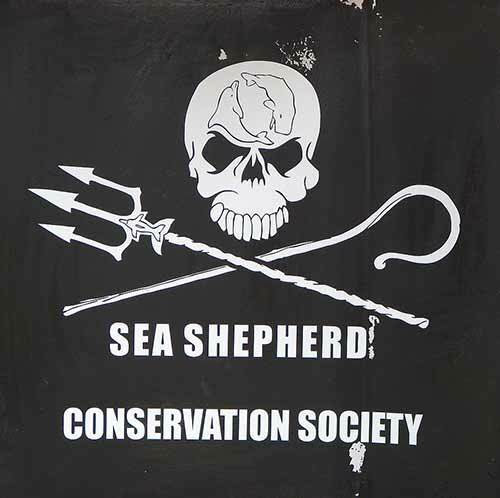 On the flipside, many Sea Shepherd volunteers feel ostracized or even demonized by the locals, who will sometimes ridicule or outright refuse service. 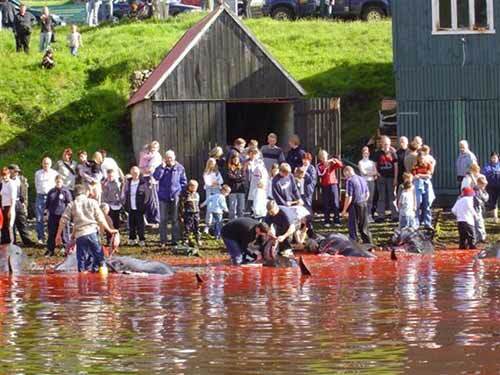 In recent years, the Faroese government (backed by the Danish navy) has begun arresting and persecuting those who interfere in their countrymen’s slaughter. This has been met with international uproar, with even major publications joining the Grind debate. I’ve already outline the Faroese arguments with regard to their custom; this is an attempt to explain the activists’ point of view. **My personal opinions are indented. The first point that one will bring up in contesting the Grind is that the slaughter is unnecessary for sustenance; the Faroe Islands are a wealthy modern country with an advanced infrastructure. Whale meat is purely a delicacy there, as the grocery stores are filled with other meat and produce options. The counterargument is one of stubbornness and preference; the Faroese don’t care that they have other options, as they feel whale meat is an integral part of their cultural identity and cuisine. They point to dozens of other cultures that continue to hunt and farm other animals while maintaining a much more advanced grocery network. Grind meat is rife with unhealthy levels of mercury. The Chief Medical Officer in the Faroe Islands advises against the consumption of pilot whale entirely, stating that it is dangerous especially for children or pregnant women. Many Faroese limit themselves to a thumb-sized sliver of whale at a meal, with the knowledge that any more would be harmful. Of any argument against the Grindadráp, this one is perhaps the most bulletproof. You can’t refute the science, even if other countries were the ones that created and spread the pollution. Many activists claim that whales are going extinct, and that Faroese whaling contributes to the decimation of the species. While this is certainly true for some hunted whales, like humpbacks and gray whales, the impact of hunting pilot whales is statistically negligible. Many of the Faroese I spoke with also stated that if the Grind proved to threaten pilot whales, the islanders would have no problem ending the ritual. They backed up such a claim by referencing the puffins on the island of Mykines — when the birds were dwindling, the Faroese stopped hunting them entirely to let the population recover. a) A Faroese boy or man must be of age, and must be physically able to hoist and wield dangerous tools. b) Before they are allowed to touch anything, the hunters must be students — the Faroese attend a class where they learn proper whaling technique and safety. They rehearse the proper ‘killing blow,’ which is a deep gash behind the head of a whale that cuts their spinal columns. This is supposed to be the swiftest and most painless way to slaughter. c) If they ‘pass’ (whether or not there is an exam is unclear), the Faroese are allowed to participate in any future Grindadráp. Some told me they were issued a card which is checked by authorities upon approaching an active beach. Though this all seems very orderly and thought-out, several Faroese also told me that if you speak Faroese, you’ll never be denied entrance to or participation in a Grind. It is a coming-of-age that is not to be denied lightly. 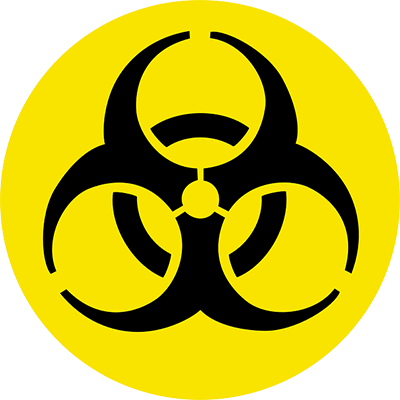 In theory, the slaughter will be very clean, quick, and efficient — but if one watches videos of the event, it is obvious that the PR does not match reality. As much as the Faroese may earnestly want the whaling to be painless, the very nature of it makes it an imprecise hunt; it is blatantly painful and stressful for the whales. The cheers and whoops cast an eery air over the event — no slaughterhouse that the Faroese scrutinize in their defense of the Grind enjoys the killing. The intellect of pilot whales is well-documented. The creatures are gentle, social, and highly-intelligent. It is said that a pilot whale has the same capacity for thought as a 5-year-old human. They feel pain, and can communicate stress to one another. They are nurturing to their young and mourn death. Several Faroese I spoke with pointed out that cows and other harvested meats are killed much more often and much more inhumanely than whales; while this is very true, and is very much a valid counterpoint, these animals do not actually boast a similar propensity for terror. In fact, it’s not even close. Many activists raise an outcry over the legality of Faroese whaling, as the United Nations outlaws the practice, and the Faroe Islands are part of Denmark. The truth is complicated, and must be prefaced by a quick breakdown of the Faroe Islands’ autonomous state. 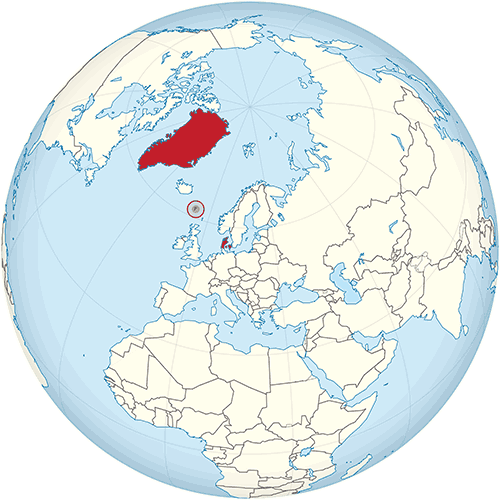 The Faroes are a sovereign state under the Kingdom of Denmark. In international relations, this usually means that the territory is self-governing, but its laws are determined at their ‘parent’ country’s’ discretion (like the U.K. vs. Scotland, or the U.S. vs. its states). But the Faroe Islands are also allowed to create local laws that supersede federal law, which is unusual — hence, Faroese banknotes, parliament, prime ministers, and whaling regulations. The Faroe Islands are an individual member of the Schengen Area — but they are not an E.U. member state. There are many cultural and economic reasons for this, in which the Faroese are surprisingly well-versed. The Faroese military is actually the Danish military. In Faroese waters, the vessels and personnel operate under Faroese law. E.U. laws, from tariffs to restrictions, hold no clout in the Faroes. The Grind, albeit controversial, is entirely legal. 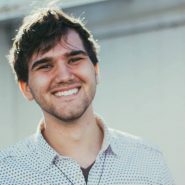 I’m a digital nomad who earns his keep online. At PercentSharp, I’m the Director of Strategy. Sometimes I eat banana peppers right out of the jar.